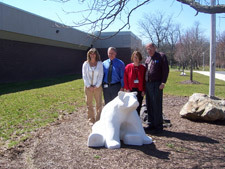 The theme of the bear is diversity. 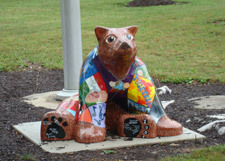 The bear is painted in a patchwork style; each patch represents a different country or a different aspect of school life. 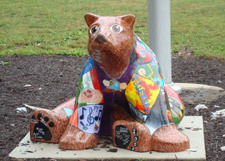 Some examples feature Boyertown Bears sports, fellowship, music, ensemble, theater, academics, and service clubs. The patches representing countries each have the word “together” written in the language of that country. 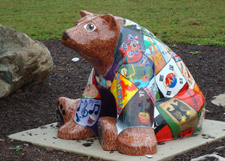 On the bear’s shoulders are two golden rings that are grasped by hands representing a diversity of cultures and ethnic backgrounds. 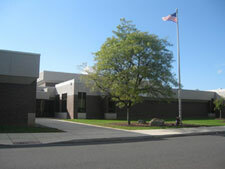 The theme was selected from about 15 designs that were submitted by the students. 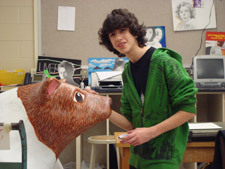 Caitlin Serbin created the winning design. 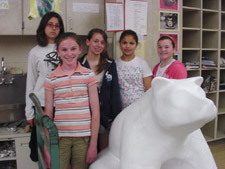 The sponsoring groups--Builder’s Club, Student Council, East Family Network, and Starting Your Own Business classes were involved in the judging. 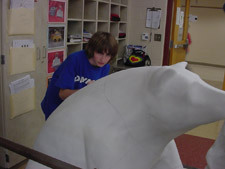 The name J.T. 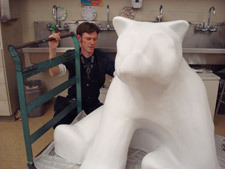 Bear was the most popular name among those submitted by students.